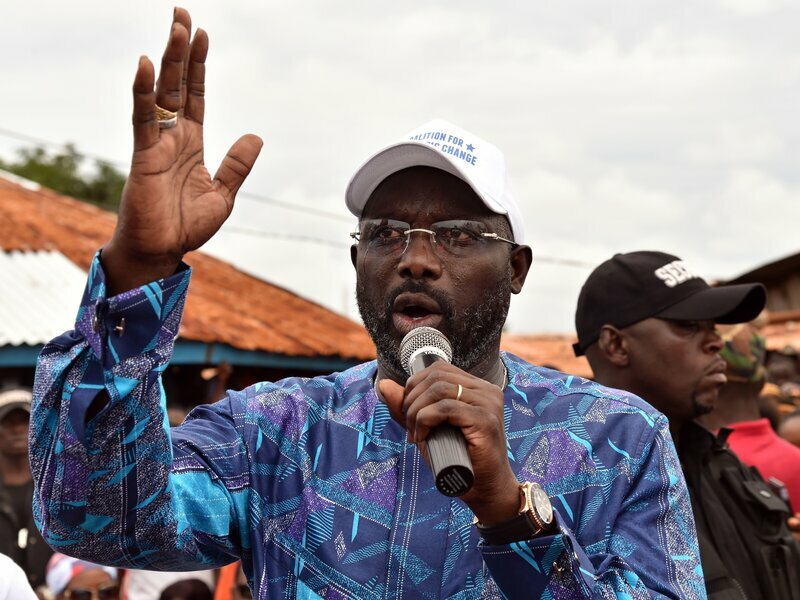 Former international soccer star George Weah has won Liberia’s presidential runoff, the country’s election commission announced Thursday. Weah had run unsuccessfully for president twice before. NPR’s Ofeibea Quist-Arcton reports that many Liberians identify with the 51-year-old footballer, who grew up poor and was not part of the social or political elite. Critics say Weah has limited experience and education. Soccer’s international governing body, FIFA, has described Weah as “a towering figure on the ’90s football scene.” He burst onto the world stage at Monaco under manager Arsene Wenger and went on to play at some of the sport’s pre-eminent clubs: Paris Saint-Germain, AC Milan, Chelsea and Manchester City. He is the only African playerto have won FIFA’s World Player of the Year. He announced his retirement in August 2003. Weah’s vice president will be Jewel Howard Taylor, ex-wife of former president Charles Taylor, who is serving a 50-year sentence for war crimes. Some are askingwhether the former president will try to influence the country’s politics from prison. The former football star George Weah has won Liberia’s presidential election, defeating the vice-president, Joseph Boakai, in a runoff with 61.5% of the vote. Thursday’s announcement by the country’s election commission chair, Jerome Korkoyah, means Weah will succeed Ellen Johnson Sirleaf as Liberia’s president next month, after an election fraught with accusations of fraud and irregularities. It will be the country’s first democratic transition since 1944 and follows two devastating civil wars. The commission said Weah had taken 61.5% of the vote, based on 98.1% of ballots cast. Spontaneous celebrations erupted in the capital, Monrovia, a Weah stronghold. Supporters danced, clapped and sang “Olé, olé, olé” outside the electoral commission’s offices as the results were read out. Weah, a national sporting hero, topped the first round of voting in October with 38.4% but failed to win the 50% necessary to avoid a runoff. Boakai came second with 28.8%. Weah, 51, is the only African to be Fifa’s world player of the year or to have won the Ballon d’Or for Europe’s best player. At the time, Nelson Mandela called him the “pride of Africa”. Weah played for Paris Saint-Germain and AC Milan in the 1990s before moving to England late in his career for spells at Chelsea and Manchester City. His was already an inspirational story to a generation of Africans: he grew up in Clara Town, a poor suburb of Monrovia, and played football across the river in West Point, Liberia’s biggest informal settlement, where he still has a large fanbase. Many see his becoming president as a fitting next chapter in the rags-to-riches fairytale and one that gives them hope. Weah’s road to the presidency has been long. He lost to Sirleaf, the first female elected head of state in Africa, in 2005, and then, as running-mate to William Tubman, he lost again in 2011. But even if it has taken him 12 years, winning the presidency is just the beginning of probably the toughest game of Weah’s career. An estimated 250,000 people died during two back-to-back civil wars between 1989-2003 and, more recently, Liberia suffered a devastating Ebola outbreak. The country is extremely poor: more than 80% of people live on less than $1.25 (93p) a day, and hundreds of thousands of children are out of school. Not everyone is convinced Weah is the man for the job. Kawolo Suah, a Monrovia resident, said Weah would only look after his supporters and that would set him against the Liberian people. Weah’s running-mate is Jewel Howard-Taylor, the ex-wife of the former president and warlord Charles Taylor, who is serving a 50-year sentence for war crimes in a prison in Durham, in the UK. Howard-Taylor is a respected and powerful senator, but her links to her former husband, including her promise this year to bring back the agenda of his party, has caused much criticism. Boakai is Sirleaf’s deputy, but some of the blame for his failure has been attributed to his boss’s refusal to support his candidacy or campaign on his behalf. Sirleaf has stayed quiet on who she wanted to succeed her. Speaking to a Liberian radio station, Boakai put their soured relationship down to his “guilt by association” with Varney Sherman, a top lawyer and politician who was arrested last year over an alleged bribery scandal. The “grandmother president” has been credited with keeping the country together and peaceful after its bitter civil wars, but her presidency has also been marred by allegations of nepotism and corruption. Sirleaf’s office said it had set up a team “for the proper management and orderly transfer of executive power from one democratically elected president to another”, adding that it included several ministers. 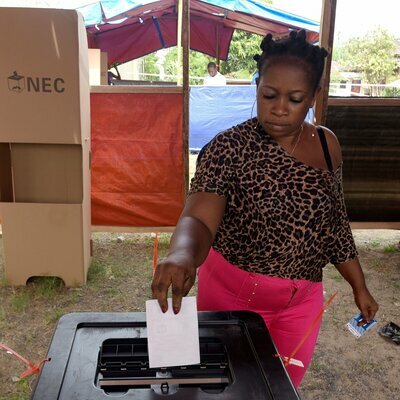 The UN secretary-general, António Guterres, hailed the “peaceful conduct” of the vote, praising “the government, political parties and the people of Liberia for the orderly poll”.